Mariners Latest: Is Justin Smoak Finally Almost Justin Smoak? 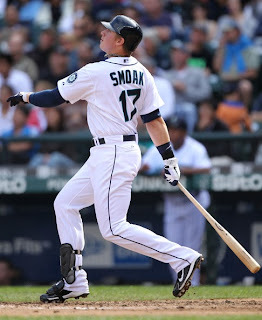 Is Justin Smoak Finally Almost Justin Smoak? That's a question that, for most of us as fans, is easy to answer. Compared to what Justin Smoak has been in the past, absolutely he's an every day player. He doesn't have the power you'd expect from a first baseman, but he's gotten better as a hitter overall. Earlier in the season, he was struggling with runners on base and now, every time he fails when there's a runner on it just add fuel to the fire. After looking at the numbers though, that assumption may be wrong, at least for the last several weeks. So what do you say? Shall we take a look at things, assume some things, maybe even conclude some things? For the sake of comparison, I'll keep it to this year, plus 2011 and 2012. He had just about 400 plate appearances in 2010, but 2/3 of those were in Texas and a sample size of 122 plate appearances is too small for some of the overall numbers. I'll add that this season, he's had 127 fewer plate appearances than 2011, but with a total of 362 for the 2013 season, I can live with that. Smoak's power has never really been the issue. His HR/AB rate so far this year is 24.2, while in 2011 and 2012 it was 28.5 and 25.4, respectively. For a player who was thought to have 25-30 home run power, that's pretty bad. Not every first baseman is a power hitter though, and Smoak isn't getting any younger. He may have a breakout season and hit 35 home runs at some point, but there aren't very many surprise type players out there. Jose Bautista and Chris Davis are two that spring to mind, but Bautista never hit for power and suddenly hit a ton of home runs. Davis always had the power, but not the ability to hit the ball in game situations. Smoak, on the other hand, hasn't even had a full year of success yet and looking at players that broke out later on in their career isn't fair to Smoak. He is what he is as far as home run power and we're seeing what he will be. Even in the minors he didn't hit for much power, but he was expected to grow in to it. That may have been a little bit of a miss on talent evaluators. Even so, Smoak may end up as a Morales type guy with less power, which isn't exactly horrible. .....One of his bigger problems is left handed pitchers. This season has been his worst so far with a massive platoon split. As a left handed batter against right handed pitching, his slash line is .308/.407/.538 for this season. As a righty against a lefty, he's at .191/.269/.234. If that doesn't make you weep a little, you're not a Mariners fan. Or you are and you're just used to the disappointment. Since it's not even a full season with a sample of 94 at bats, it's nothing to get excited/depressed over, but its not something you want to see. June is somewhat of an outlier with only 39 plate appearances, but even disregarding that month, he improved every month up until now. One caveat on those numbers is that its August 15th. He could come crashing down in the next two weeks, but it looks nice and shiny beside all those other numbers, so we'll go ahead and keep it in there. Its a small time frame, just short of a month, but in every aspect, he's improved when there are runners on base when he comes to the plate. Hitting with runners on base is partially luck, but its also skill and what the player can do in the course of an at bat to either move the runners along or get them across the plate. The mental side of the game is just that. Something inside a player's head. You can point at all the numbers you want, but the main thing you get out of that are numbers. Players are human. It has just as much to do with what's going on inside Smoak's head as it does with what's happening on the field. The mental part is something nobody has been able to quantify and probably will remain that way. For the time being, all we can do is look at the before and after, smile and knock wood every chance we get in the hopes that its real.